Port Townsend, today. Last year, when I wrote a couple of articles about the stations on the Skeena Subdivision, I struck up an informal email contact with Ms Chantal Meijer, of Terrace B.C., whose Dad was a Foreman at Kwinitsa Station. Those of you who've been following my blog have heard me mention fondly of Kwinitsa as being the point for freights heading up the Skeena Subdivision to stop for a walking inspection within 50 miles of leaving Prince Rupert. As a young man riding the freights, this was the place where I would do an end for end seating switch with a trainman, me riding the remaining miles to Terrace in the cab. Ms. Maijer lost her Father last year. She has since written a short story about growing up in a railroad station - Kwinitsa for one - and I am honored that she has allowed me to present her story here. My father was a railroader. 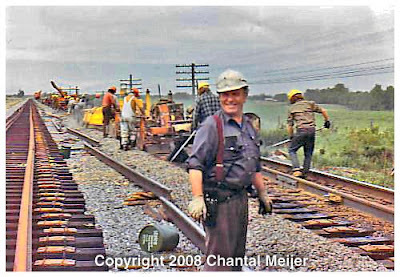 He worked on the tracks for CN for 35 years, from 1952 to 1987. 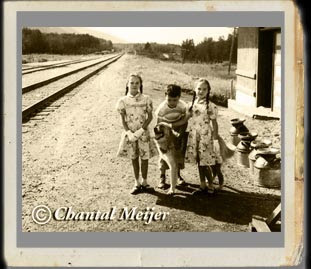 We were a railroader’s family, and we lived in railroad stations in central and northwestern B.C. A few years ago when I sat down with my parents to pen some family history, my dad went into absorbing detail, especially about his railroad days. 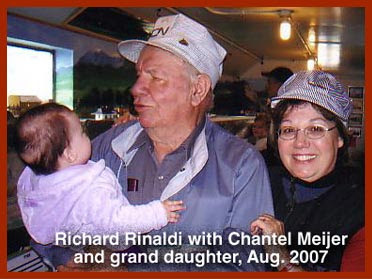 My dad, Richard Rinaldi, came to Canada from Paris, France in 1952 to ‘test the waters’ of a new country. The impetus for his immigration: lack of housing in post-war Paris. He found employment with CN, starting out at a remote railroad station called Kwinitsa, mid-way between Terrace and Prince Rupert. From there he cajoled Mom – who was still in Paris – to join him, with their three toddlers. There was little at Kwinitsa except the station and a couple of railroad houses, the Skeena River and the mountains. After only a few nights there, we moved to Dad’s next posting a few rail miles west. Telegraph Point was sandwiched between the roaring Skeena River and the tracks. For groceries and other necessities, we rode the train – either a freight train or a passenger train – to Prince Rupert, 40 miles away. In 1957 we moved to a community that had a school. Dunster, in east-central B.C., had a two-room school which housed students from grades one through eight. 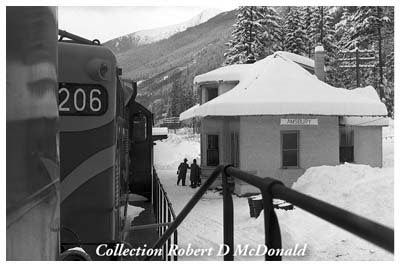 For necessities, we headed to McBride, about 20 miles away; at first, by train, then later, in our own vehicle. The station, which we lived in, had no electricity, no running water, no central heat. We used kerosene lamps, a combination wood/coal stove…and, of course, the dreaded outhouse. The Dunster station, built in 1913, still exists today. It is now owned by the community and is in the process of being restored. Dad returned to Kwinitsa, as foreman, and bunked in the foreman’s house. Mom and Dad bought their first house, in Terrace, fifty miles away. At Kwinitsa, things had not changed much since Dad’s first posting there in 1952. Kerosene lamps, coal/wood stoves, and the still-dreaded trips to the outhouse were the order of the day. 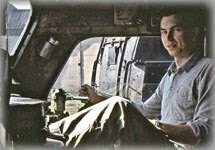 There was, however, one improvement: Dad finally had a CN truck, although he and his men still used speeders to patrol the tracks at times. In 1970 when he transferred to Terrace, he was overjoyed to be reunited with the family. Two years later, he arranged for the then-empty Kwinitsa house to be tracked to Terrace. The Kwinitsa station still exists today. The only surviving station from the Skeena rail line, it was barged to Prince Rupert in 1985, where it is now used as a railroad museum. For the last seventeen years of his railroad career my dad performed double duties: During the winter months, he was the foreman in Terrace; from spring to fall he supervised large steel and ballast gangs throughout BC, Alberta and Saskatchewan. Alas, that meant being apart from the family for long stretches of time. Mom and Dad always endured, buoyed by the great love they had for each other and their children. Dad was proud of his career. He had progressed from section man to program supervisor, a position he held for the last eight years of his career. By all accounts he was a great railroader and a master at laying tracks, but it meant working outside in all kinds of weather. He never forgot one particular winter in his early days when the temperature hovered between -32 degrees Celsius and -43 Celsius for 35 days – and every day he patrolled the tracks on an open speeder. After his retirement in Terrace in 1987 Dad turned his attention to model railroading. In a 1911 railroad coach that he procured from Prince George, he helped the model railroaders build a layout - a replica of the Kitimat/Prince Rupert subdivisions of bygone days. And in 2004, at the age of 80, he urged city officials to save the former Kwinitsa house from demolition by CN. Now city-owned and recently renovated, the Kwinitsa house gleams alongside the tracks on the Grand Trunk Pathway in Terrace. Sadly, Dad passed away on April 30, 2008, four years after Mom, and two weeks before the grand opening of his former Kwinitsa house. The railroad days my father and our family knew no longer exist. No more do trains trundle past stations and houses filled with railroaders and their families. Steam engines, and the water towers that fed them (like the one in the backdrop of a family photo at the Dunster station) long ago disappeared, rendered obsolete by diesel engines. Speeders, like the ones my father rode on in all kinds of weather, were replaced by trucks that run both on roads and on rails. And the iconic red caboose, that I still gleefully remember riding in – it, too, sadly rode into oblivion. My father’s railroad days now belong to history. And history points us not only to the past but also to the future. For, as my wise father once told me in a railroad metaphor that will always steel me – where a train is going has everything to do with where it’s coming from. I am ever so grateful to have made Ms Meijer's acquaintance, and pleased that she has allowed me to share her story, which appears in The People’s History, a Royal B.C. 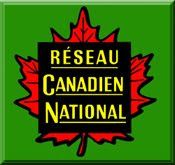 Museum project commemorating British Columbia’s 150th anniversary (in 2008). To view this story as well as other stories, photography, video and sound from people in B.C.- visit the Royal B.C. Museum’s website. The Railroader and accompanying photos Copyright 2009 Chantal Meijer.